Fresh homemade churros are always a treat, but when you add a dipping sauce made from melted white chocolate and peanut butter? That's heaven on a plate. Bring water, 3 Tbsp. sugar and butter to boil in medium saucepan on medium-high heat. Add flour; cook and stir on low heat 1 min. or until mixture pulls away from side of pan. Remove from heat. Add eggs; beat until blended. Stir in vanilla. Spoon into pastry bag fitted with large star tip. Mix remaining sugar and cinnamon in shallow bowl until blended. Heat oil in deep fryer to 350ºF. Pipe dough, in batches, into 5-inch-long strips into hot oil; cook 3 min. or until evenly browned, turning after 1 min. Remove from oil with slotted spoon; drain on paper towels. Add warm churros, 1 at a time, to reserved cinnamon mixture; toss to evenly coat. Melt chocolate as directed on package; stir in peanut butter until blended. 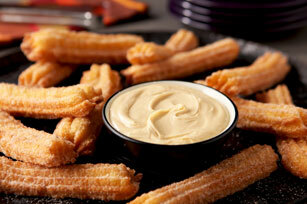 Serve with warm churros. Microwave 1 oz. Baker's Semi-Sweet Chocolate, 20 Kraft Caramels and 1-1/2 cups frozen Cool Whip Whipped Topping in microwaveable bowl on HIGH 2 min. or until chocolate and caramels are completely melted and sauce is well blended, stirring after each minute. Microwave 25 Kraft Caramels and 1/4 cup water in microwaveable bowl on HIGH 2 min. or until caramels are completely melted and sauce is well blended, stirring every 30 sec. Microwave 4 oz. Baker's Semi-Sweet Chocolate and 1-1/2 cups frozen Cool Whip Whipped Topping in microwaveable bowl on HIGH 2 min. or until chocolate is completely melted and sauce is well blended, stirring after each minute.